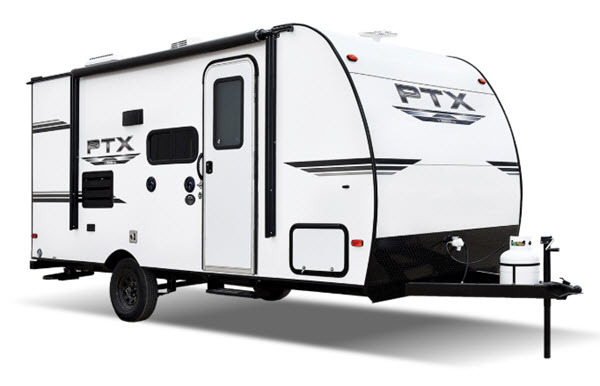 In every Prime Time PTX, you will find a travel trailer that is light-weight and versatile for the most discriminating of adventure seekers. Each PTX is fit for any off-road adventure or tranquil escape with its rugged construction paired with its refined amenities. It boasts on having a roomy interior with a full 6' 6" of interior height, despite it being engineered as one of the lightest travel trailers on the market! These Prime Time PTX trailers have entertainment features galore. Some of these features are the cinema quality soundbar and LED backlit speakers, a built in bottle opener, and a pet leash attachment underneath the LED lit power awning on every floor plan. You can also easily whip up your best meals inside the kitchen with the 6 cu. ft. refrigerator, the two burner cooktop, and the microwave, plus a kitchen skylight to add in some natural lighting. There are also mini blinds and tinted safety glass windows throughout the travel trailer for added privacy! You won't be disappointed when you choose any one of the Prime Time PTX travel trailers! Come get yours today! Oversized Holding Tanks: Fresh = 37 Gal. ; Gray = 30 Gal. ; Black = 30 Gal.